The Women's Technology Empowerment Centre - W.TEC has two information technology training programmes coming up for women in April and May. This article by Rebecca Wanjiku explores the new work and economic opportunities that information technology has opened up for African women. This short video produced by Nadia Tareen for Girls Learn International, speaks to teenage North American girls about their social media usage patterns and how it's influenced their lives. The girls talk about social media's potential for activism and offering new ways to stay in touch with their friends. On the other hand, they also share their fears about cyber bullying, protecting themselves adequately in their online interactions and the biggest of all drawbacks - time wasting. The 2010 ICT4D Bursary, worth £6,000, is available exclusively for developing country applicants to the University of Manchester's one-year MSc ICTs for Development degree programme (www.sed.manchester.ac.uk/postgraduate/taught/courses/06237/index.asp). Application and eligibility details can be found at: www.sed.manchester.ac.uk/postgraduate/taught/funding/idpmbursaries.htm. I'm honoured to participate in the Ada Lovelace Day again this year. In the spirit of writing about a woman who has inspired me in the technical realm, again I did not have to look very far. Last year I blogged about Dr. Nancy Hafkin, who has written widely about how information & communication technologies (ICTs) can promote and facilitate social and economic development in Africa, particularly for women, and who I have met. So again, this year I have decided to write about another woman who I am fortunate to know personally. Dr. Abi Jagun is a telecommunications and development researcher - specifically the impact of technology on society, particularly how mobile communications devices affect socio-economic development. She is a freelance researcher, formerly a Research Fellow in the Department of Management Science at the University of Strathclyde Business School. Prior to that, she worked with the Association for Progressive Communications, as Africa Policy officer, and as a lecturer in the Institute for Development Policy Management at the University of Manchester. She got her PhD from the University of Strathclyde, U.K. in 2006 following research into telecommunications and the structure of economic organisations, focusing in particular on the textile sector in Nigeria. I met Abi several years ago when I lived in Boston. She was in town to attend Harvard Business School's African Business Club annual conference. We hit off and I was impressed by the fact that she was a doctoral student at the time - particularly in a field that I shared an interest. At the time I saw my future in research and possibly academia. Although many of my colleagues at Education Development Center in Newton, MA did not have PhDs, I saw the degree as one way to move more firmly in that direction. Abi encouraged me to go for it, although she didn't shy away from sharing the challenges of doctoral studies, like the isolation students feel sometimes and the frustration when your work is not gong well. Notwithstanding, she bubbled with enthusiasm for her work, while appearing to have a vest for life outside of school. So while Abi is not an engineer or a programmer or working in one of the more technical aspects of computing and information technology, like Nancy Hafkin she is educating and informing the world, through her research and writing, about how technology can make our lives better. Abi is now one of the advisory board members for the Women's Technology Empowerment Centre - W.TEC, which I am personally so thrilled about, and has so generously shared of her time and expertise. Although I have not (yet!) embarked on a PhD, she certainly filled me with encouragement that I could do it. I will think about how it fits in with my life plans, but in the meantime, through W.TEC, research is part of my work now. Learn more about Ada Lovelace Day: http://findingada.com. March 16 is the date that young Nigerians will march in Abuja to say ENOUGH IS ENOUGH! 3) The 5-month fuel crisis needs to end now. HOW CAN YOU BE A PART OF THIS HISTORIC PROTEST/RALLY? · From wherever you are in Nigeria, come too Abuja and join the rally – if you book early on many airlines, you get cheaper tickets, and you can return on the same day! · If you are in Abuja, attend the rally with an average of TEN of your friends/family. · If you are in any of the neighbouring states - Plateau, Kaduna, Niger, Nasarawa, Kogi – attend the rally with an average of FIVE of your friends. · Get at least FIVE of your friends and family who live or work or school in Abuja to attend the rally. · Get at least FIVE of your friends and family who live or work of school in neighbouring states – Plateau, Kaduna, Niger, Nasarawa, Kogi – to come to Abuja and join the rally. · If you cannot attend yourself and you can afford it, sponsor at least one other young person to attend on your behalf. To get more information about how you can do that, call 0702.810.1959 or mail info@enoughisenoughnigeria.com. · On your Facebook (groups and profiles), Twitter, and BBMs, update DAILY with the date and time of the rally, as well as the website www.enoughisenoughnigeria.com until the 16th of March so that people do not forget. · Join the Facebook group Enough is Enough Nigeria and invite your friends and family to join. Our target is 10000 members by the end of March. We need more people involved! · Put up information about the rally daily on your website and blogs to sensitise young people so they don’t forget the date, venue and time. · There are plenty of logistics that we have to deal with – buses, water, legal, media & publicity, crowd control, mobilization, distribution of publicity materials etc – if you have experience or resources in any of this, please call 07028101959 or email info@enoughisenoughnigeria.com to offer your help. · SUPPORT the rally. There is so much to do in so short a time and we NEED the support of as many young and older people who are fed up with Nigeria’s situation. If you are ready to support, please call 0802.222.6712 or 0702.810.1959 NOW! www.NaMyWedding.com is a wedding planning and community website. The site contains an extensive wedding directory, a wedding advice section and planning tools to enable prospective couples find wedding vendors, keep track of their wedding plans. Hits on namywedding.com have sky-rocked in the barely 3 weeks of its existence. With now over 10, 000 registered users and 110 couples in the competition, it’s a furious scramble to the top. The top ten contestants with the highest votes will be invited to the gala night and launch of namywedding.com, which will take place on April 10 2010. At the gala night, one lucky couple out of the top ten will win the grand prize of a dream wedding valued at over N 4million. With sign-in options from Facebook, this is a complete and easy-to-use social networking website for couples planning a wedding, hoping to get engaged soon or just crazy about weddings. The popularity of this site also shows that young Nigerians are increasingly digital natives. 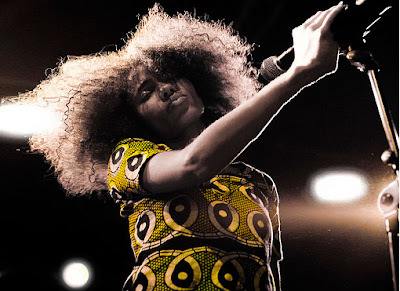 Nigerian singer Nneka who has gradually been rising to prominence in the global music scene will perform next Friday at Jazzhole. Tickets are available at The Jazzhole. For more information call 01-895.3498 or 0706.064.8580.